Will Obama announce a deal with Iran for a moratorium on the enrichment of uranium in return for dismantling sanctions? With 29 days remaining in the race for President, White House 2012’s latest analysis of polls, circumstances, and conditions, concludes that there is a swing towards Mitt Romney in the Electoral College that is so pronounced that the Romney-Ryan ticket has increased its lead over the Obama-Biden ticket by at least 24 electoral votes. 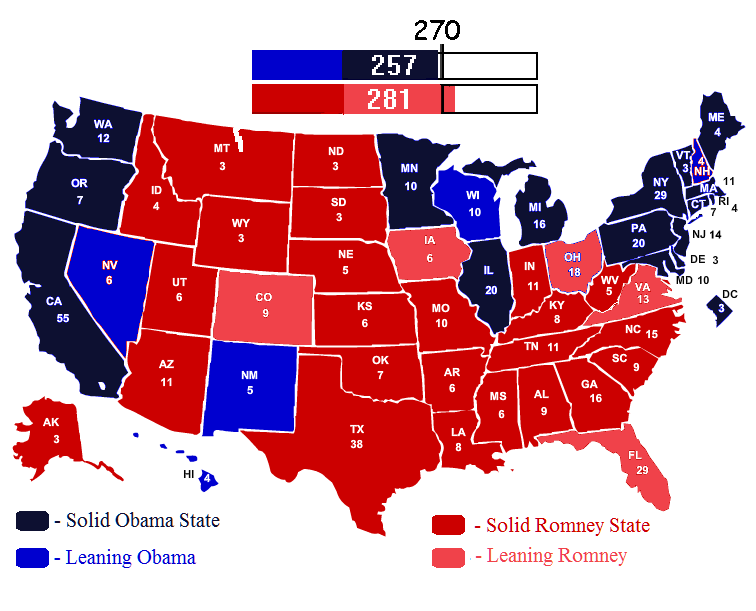 The last White House 2012 projection had Mitt Romney winning 273 electoral votes to the presidents 265 electoral votes. Today Romney stands at 281 electoral votes to 257 for the President. For the first time, the latest projection gives Romney the all important state of Ohio, which up to now has been written off by White House 2012 as an almost certain win for President Obama. However, small shifts which have revealed themselves in most of the polls figured in to the Real Clear Politics average of polls since Romney’ stellar debate performance last Wednesday, now indicate that if the numbers hold up, Romney will win Ohio, a change that significantly increases the number of ways that Romney can reach the magic number of 270 that is needed to win the presidential race in the electoral college. While Romney seems to be gaining momentum, it is too early to call it a steady trend, especially given the fact that while Romney has picked up Ohio in the newest projection, New Hampshire and Nevada which Romney did have in column last week, have flipped back to President Obama today. The good news is that combined, New Hampshire and Nevada have a total of only 10 electoral votes while by itself Ohio has a total of 18 electoral votes. So even if Romney did lose Nevada and New Hampshire, he stands on better ground after picking up the Buckeye State. However; it is important to note that White House 2012 is being very conservative by flipping New Hampshire and Nevada to the Obama-Biden ticket. While the RCP average has pushed the President’s lead in those two states to be in excess of the 3.7% margin of error which we give to Mitt Romney to compensate for each polls poor judgment in the use the 2008 turnout models, other factors prove to be working in Mitt Romney’s favor and allow us to give the President those states by only the slimmest of margins. So both New Hampshire and Nevada are now only barely light blue for the President and they could easily turn pink for Romney at a moment’s notice. White House 2012 does see the potential for Romney to become much more competitive in Wisconsin, New Mexico, and possibly Michigan but for now, we do not consider them to be battleground states. As the race continues to evolve, this projection will change, however; at the moment the race is shaping up to be one that is moving in Mitt Romney’s direction. For instance, it is with good reason that we continue to forecast Romney victories in the critical states of Florida and Virginia. While some polls show small Romney leads in those states, most all other polls show Romney to have at least closed the small previous gap that existed between him and the President by as much as half or more. For example, the latest number from PPP, a Democrat leaning polling outfit, shows that in Virginia, Obama’s lead has shrunk from +5 to +3. While that Obama lead might not seem like good news for Romney, it is actually very good news when you consider the fact that by using the same turnout model from 2008, the PPP sampling finds this smaller Obama lead even after still giving Democrats a +6 advantage over Republicans. Furthermore; it is that same Democrat advantage that polls are giving to the President which we see in other states such as Ohio, Florida, New Hampshire and all the other critical swing states. Yet despite this Democrat advantage, Romney is gaining on the President. So much so that WH12 sees evidence that indicates the Romney-Ryan ticket will probably not only win the election, they will probably win it by an even wider margin than anyone thinks possible. Adding to this positive direction for Romney are indications that his own internal polling in at least two states. Currently, those internal polls are said to show Virginia and Ohio show him beating Obama by as much as 3.0% and 4.5%, respectively. The recent questionable jobs report has provided a slight spike in consumer confidence but it has not yet translated in to a bounce for the President. At the same time, President Obama’s approval ratings continue to remain at or below 50%, a position not conducive for reelection of an incumbent President. 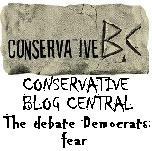 Meanwhile, after his initial debate performance Mitt Romney has established himself as a real threat to the reelection of President Obama. For the first time since their conventions, Romney is seeing evidence of his base becoming excited with his candidacy and there are signs that undecided voters are moving in his direction. But Republicans must be careful to not consider this a trend until and unless future polls over the course of the next week show these recent numbers to still be moving in the right direction. 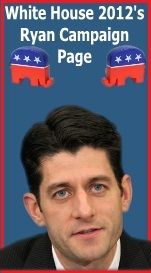 However; at the moment the Romney-Ryan ticket seems to have blocked President Obama’s own forward momentum in the polls and at the same time has finally gotten his campaign moving at pace that could turn the tables on the Obama-Biden and make them the ones with fewer paths to victory. 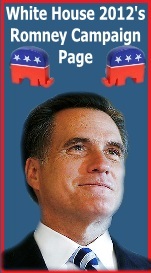 But to do that, Romney must be sure to keep the momentum moving in the right direction and at the right pace. To do that, Romney must avoid any stumbles on the campaign trail and he must make sure that an endless repetitive stream of his well crafted 30 second ads are driving home his message and allowing it to sink in among the voters who have a new found respect for Romney after his first debate and are now more receptive to his message than they have been at any other point in this election. 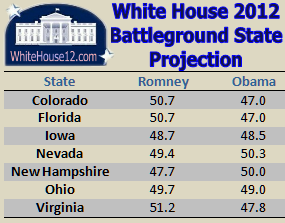 The White House 2012 projection takes the Real Clear Politics average of polls and compensates for the outdated 2008 turnout models being used in each in poll by compensating for the under-counting of Republican turnout by adding to Romney’s total, the 3.7% average margin of error in the seven key swing states of Colorado, Florida, Iowa, New Hampshire, Nevada, Ohio, and Virginia. Then along with a dose of personal political instinct, our projection incorporates other factors in to the equation such as the unemployment rates of individual states and the organizational strength of each state’s Party.